By the time an application gets to version 10, you stop expecting major new features and changes. If you’ve been using previous versions, a consistent look and feel is important - after all, you don’t want to throw away the investment in time you have to relearn an application. Thankfully, DxO has stayed on track with their interface - a good choice as it’s an easy program to navigate through compared to some of the competition. There are some minor tweaks that feel intuitive, but most of the tools you’ve used work like they did before. And, while there is not a long list of new features in version 10, there are some welcome improvements to speed, camera and lens support, and a very nice addition by way of ClearView which removes atmospheric haze, and a increase in quality to their noise reduction, which was already one of the best available. One of the nicer changes is the ability to work with the white balance and dust removal tools in full screen mode. DxO 10 is available in two versions - Essential, at $129, and Elite at $199. The Elite version, which I looked at is where all the great stuff is found. Along with their PRIME denoising and ClearView, you get a moire reduction tool, ICC color management, the ability to create presets, customize palattes, and select multiple types of output. Both versions include DxO smart lighting, optical corrections from over 20,000 lens and camera configurations, and the essential editing tools. I look at DxO as a raw converter with some unique features that can make the difference between a great image and one that either ends up in the trash or takes more time to edit than I want to invest but has promise. What I don’t see it as is a image organization tool. For that, I depend on Lightroom. To be honest, if I can accomplish my editing needs without leaving Lightroom, that’s my first choice. 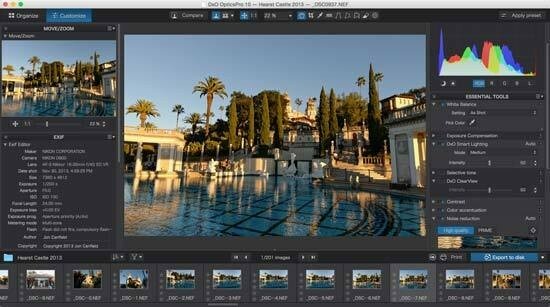 However, DxO has made it as seamless as possible to work with Lightroom - direct import and export to Lightroom are supported, so there are no additional steps required other than choosing Edit in DxO and then returning those adjusted files back to your Lightroom catalog. Now with version 10, you can work with DNG files, making the highest quality available for editing (the RAW file must be supported for DNG editing to work). The list of supported cameras and lenses is impressive, and DxO issues frequent updates with new camera and lens options. 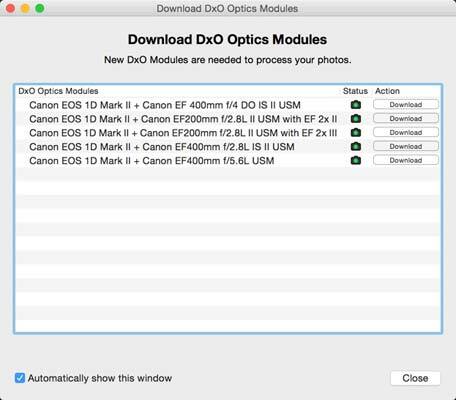 If you try to work with an image that you don’t have the modules installed for, DxO will prompt you to download the needed files. Sadly for me, DxO doesn’t support the Fuji X-Trans sensor. Since moving to a Fuji X-T1 as my primary camera, I’m limited to using my older Nikon and Canon files with DxO Optics. I can edit JPG images from the Fuji, but this isn’t part of my normal workflow. PRIME noise reduction is claimed to be up to 4 times faster than previously. Saving an image as JPG took 1 minute 12 seconds on my current Retina MacBook Pro while the standard options took 1 second. So, it’s still significantly longer, but the results can be amazing. It only works with RAW files, so if you’re a JPG shooter you won’t benefit from this feature.